It has been estimated that approximately 200,000 women globally are diagnosed with ovarian cancer, often in its late stages, each year. It is very difficult to detect ovarian cancer in its early stages, and by the time it is identified, the body is already invaded with numerous tumors. A Massachusetts General Hospital surgeon demonstrates the Lincoln Laboratory’s near-infrared fluorescence imaging (NIRF) system. The system’s camera detects probes attached to tumors, and displays their "glow" on a monitor as he performs surgery. Photo courtesy of the researchers. A study performed by Massachusetts General Hospital (MGH) in 2010 discovered that the lifespan of the patient can be significantly prolonged if tumors of millimeter size are removed during surgery. Since then, researchers from MIT and MIT Lincoln Laboratory staff, with MGH surgeons have explored a new approach to detect and remove tumors that are not visible to the human eye. Led by Professor Angela Belcher at the Koch Institute for Integrative Cancer Research, the MIT researchers have been studying a number of different cancers that present complications due to delayed diagnosis. They created new fluorescent probes on the basis of single-walled carbon nanotubes (SWNTs), which are chemical compounds that re-produce light when stimulated by a laser. The SWNT probes, when administrated to a patient, adhere only to the tumors, which glow when viewed via an infrared camera. It is best to detect this fluorescent glow in the optical spectrum spanning from 1000 to 1800 nm known as near-infrared second-window (NIR-II) band. Conversely, a video fluorescence imaging system that would enable real time imaging of this phenomenon is not available yet. 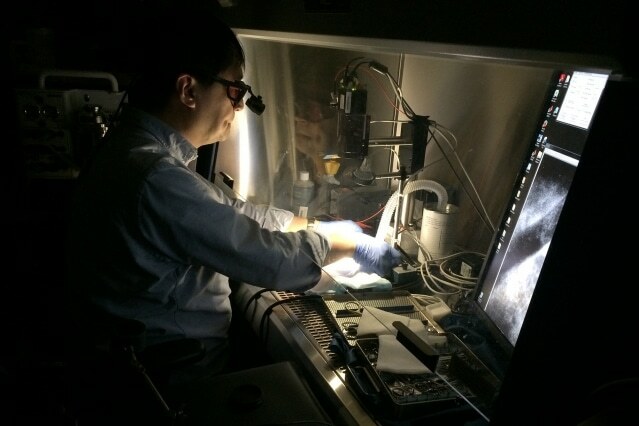 In order to achieve this feat, Belcher, who wished to test the SWNT probes on mice in collaboration with surgeons at MGH’s Birrer Lab, enlisted the help of Lincoln Laboratory's expertise to design an advanced near-infrared fluorescence (NIRF) imaging system. A few other labs were exploring NIR-II band imaging, but their equipment was designed for still imaging, not video. "Honestly, I knew this would work the first time I saw tumors smaller than pinheads lighting up on the screen like fireflies," says Andrew Siegel, elucidating his reaction to the system’s preliminary tests. Supported by colleagues, Rajan and Siegel developed the NIRF imaging system to flawlessly work with the surgeon. During the course of surgery, the SWNT probe solution is administered into the cancerous area and following this, the system lights up the tissue of the patient using an 808 nm infrared laser. Enclosed in fluorescent probes, the tumors change the 808 nm light into different wavelengths in the NIR-II spectral band, which can be easily detected by the camera of the system. The laser light is prevented from reaching the camera by a blocking filter, displaying a clear view of the glowing tumors on a screen. Conversley, healthy tissue that is not fixed with any probe seems to be dark. While surgeons were able to locate the cancers against a dark background through fluorescence, they could not view their instruments with regard to the tissue. "So we introduced a novel feature: an 'in-band' light source that the NIR-II camera can see," Siegel said. Reflecting off the tissue, the in-band light produces a true gray-scale image, which displays on the screen just about the same as it would become visible in the visible light — a familiar view for surgeons. A footswitch can be used by surgeons to modify the in-band light as they work, swapping between the fluorescent view and gray-scale view as required. Instead of surgeons having to switch their gaze back and forth between the NIRF display and the patient, they can perform the surgical procedure looking at the NIRF display the whole time. According to Siegel, the actual challenge was demonstrating that the NIRF imaging system could indeed improve the patients’ survival. During the span of two years, surgeons at MGH used the NIRF imaging system with SWNT probes to carry out over 200 procedures on mice. Before the surgical procedure, the surgeons removed all the visible tumors and then changed to the fluorescent mode to view and remove tiny tumors measuring just 200 nm in diameter — smaller than a single poppy seed. The surgeons even identified several large-sized tumors that they thought had been removed already. At the end, the overall data showed promising outcomes. Despite performing longer surgeries on the "NIRF" mice, the animals survived for a longer period of time compared to the mice that were operated with no NIRF. "Discovering that we actually observed a measurable increase in post-surgical survival, even with the negative confound created by the longer surgery these 'NIRF' mice endured, was a pleasant surprise," Siegel says. Details of this study were presented at national technical conferences this spring, and a more comprehensive manuscript illustrating the outcomes of the survival study will be published later on this year. In the future, the researchers intend to perform human trials on patients suffering from ovarian cancer. "Our MGH collaborators are currently applying for Federal Drug Administration approval for the SWNT probes," Siegel says. Meanwhile, researchers at Lincoln Laboratory would probably develop a larger-scale system. My ultimate goal would be to simplify this technology to the point that any general surgeon has the ability to provide sufficient tumor debulking to completely obviate the need for post-operative chemotherapy. Without early detection, this may be the best we can do.